WEST PALM BEACH — The value of West Palm Beach real estate plummeted from its peak of $12.7 billion in 2007 to $8.1 billion in 2012, sending city property tax collections tumbling and forcing cuts in payroll and in such necessities as police car replacements, computer systems and road repairs. But Finance Director Mark Parks said Tuesday that thanks to economic improvement nationwide and a construction surge in West Palm, property values have returned to $12.7 billion, putting the city in strong financial position. The trend is likely to continue, he said, at least in part thanks to the approaching completion of one building in particular — the Bristol waterfront condominium — which promises to add $659 million to the property tax base. So it bodes well for the budget that property values have risen, enabling the mayor and city commission to collect more revenues — and spend more — without increasing the tax rate. City revenues and spending have risen to $184 million this fiscal year, from $153 million in 2014. The tax roll also is rising because of new real estate projects. About $80 million worth of projects were completed recently, another $1 million are under construction. Add in the projects that have been approved but not yet built, and other projects under discussion, and the city estimates it has $2 billion worth of new construction in the pipeline. 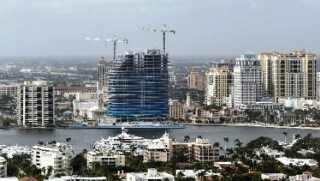 Construction continues on The Bristol, the most expensive condominium ever built in Palm Beach County. A big part of that is the Bristol, a 25-story condominium rising at 1112 S. Flagler Drive just south of downtown, on the former site of the Chapel by the Lake. The luxurious tower’s 69 condos sell for millions of dollars. One recent purchase, of an entire floor, went for a reported $40 million. The condo owners will contribute an estimated total of $5.2 million a year in property taxes to the city’s general fund, the city estimates. As the building is expected to be completed early next year, that money would start pouring in the following year, in 2020, Parks said. Countywide unemployment is down to 3.6 percent as of March, below the 4.1 percent national average and well below the 11.5 percent during the depths of recession, in 2009, he said. West Palm population growth looks steady from an estimated 110,200 now to a projected 133,500 in 2035, according to the U.S. Census. The city has “admirable” reserves of 25 percent of its general fund revenues, and strong bond ratings of AA and AA+, reflecting its fiscal stability, Parks said. A decision a few years ago to use low-interest bonds to pay down pension fund obligations has strengthened the funds while enabling the city to earn high returns on its investments. Asked whether, given its increased revenues and healthy finances the city might lower its tax rate, Mayor Jeri Muoio said it’s a matter of priorities. West Palm’s property tax rate for general operating purposes is 8.3465 mills, or about $8.35 per $1,000 of the taxable value of a home.